Meanwhile, in France, President Macron’s new party, the LREM, crushed its rivals on both the right and left. Ahead in 400 constituencies out of the 577 that make up France’s National Assembly, the party is heading for a convincing majority far higher than the 289 seats needed to control parliament. That does not even take into account the 100-odd seats where Mr Macron’s centrist MoDem allies are in the lead. His centrist alliance could control 415 to 455 seats after the second round on 18 June, experts predict. And many of them are political novices, so this could get interesting. 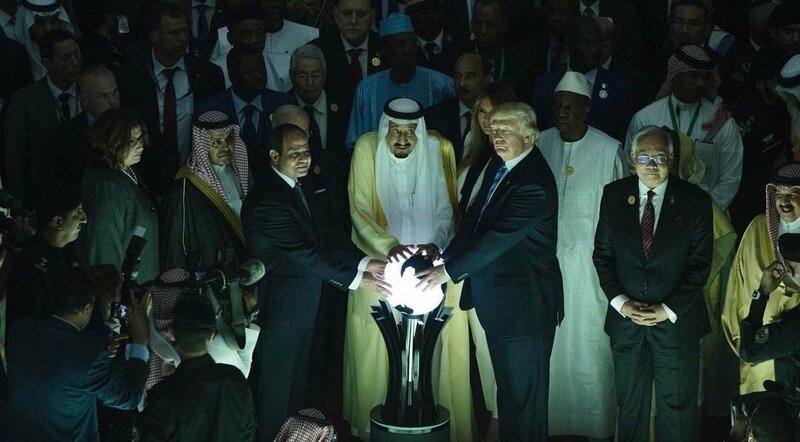 This is not a photoshop, but a genuine pix released by the Saudi Press Agency, memorializing the moment when Donald Trump joined Egyptian dictator Abdel Fatah al-Sisi and Saudi king Salman bin Abdulaziz at the opening of the Global Center for Combating Extremist Ideology. Video, if you care. Surely someone has noted by now that the first corollary of a putative Trump tilt towards Putin’s Russia is a tilt against China? For just as Kissinger and Nixon opened relations with China as a counterweight to the USSR, so today is a tilt towards Russia a way to push against China. In that context SecState nominee Rex Tillerson’s scary and bellicose words about denying China access to the islands it has built up in the South China Sea not only have a simple logic, they seem almost predictable. If Vietnam gets a kind word, we’ll know for sure this is the strategy. If, that is, you are trigger happy. Time to ratchet up the worry meter to ….